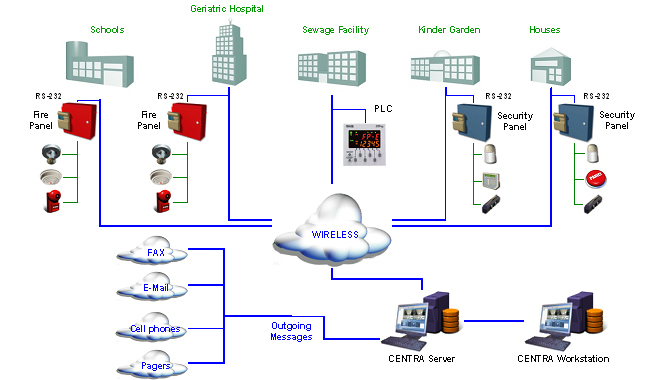 The Centra configuration is a central station system that allows controlling and monitoring a multiple site installation. Schools, Geriatric hospitals, sewage systems, kindergardens, homes, libraries, and other public buildings are secure and monitored by different devices such as fire panels, PLC controllers, and Security panels. All these operations are performed by the Centra Server and workstations. Centra receives data from all these sites, using various systems to transfer data. Once the data has arrived, Centra presents the current event to the system operator. Specific directions appear on the screen and graphic maps will show the exact location of the event. A Message can be sent out of Centra to a Fax, an e-mail address, cellular phones, and pagers. The Centra Workstations allow the system operators full access to the system, exactly like the Centra Server. Actions can be limited to specific users, according to their security level.